We’re proud of some of the unique features on AskThem, to support good questions of people in power. When developing AskThem, we didn’t just create another online petition site. 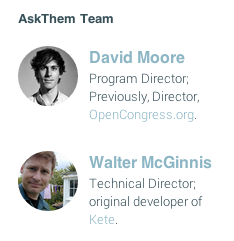 For one thing, we offer AskThem as a free & open-source platform, with open data for informed communities. 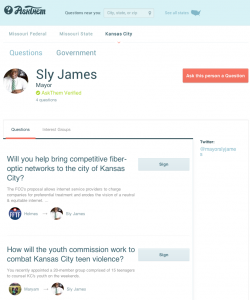 But much more goes into AskThem to surface relevant questions and encourage public responses. 1. It’s a version of “We The People” for every U.S. elected official. We have a profile page for every member of Congress, state governor, state legislator, and hundreds of municipal elected officials – we feel strongly this should exist, as an open public resource. 2. We’ve uniquely gathered the most official government data of any non-profit project. Our primary source of elected official information is the terrific Google Civic Info API, a hugely important free resource. Then, through our unique partnership with the community open-data project DemocracyMap, we have access to up to 142,000 elected officials nationally, including municipal elected officials throughout eight U.S. states, as well as our custom scraped data for select cities (e.g. San Jose, CA). 3. Our interface connects site visitors to their elected officials – at every level of government. AskThem visitors can find any elected official on our site by browsing our national map (e.g., see CA’s senators, U.S. reps, governor, state legislators, major-city mayors & more). But when visitors enter a street address or zip code from our question-creation form, they see a view of their elected officials, from municipal level all the way up to U.S. senators. This gives elected officials greater incentive to respond to public questions, if they’re generally (but not exclusively) funneled from constituents. Nearly 80 elected officials nationwide have signed-on to respond to popular public questions – any elected official can become a verified responder on AskThem, it’s free and open to everyone. 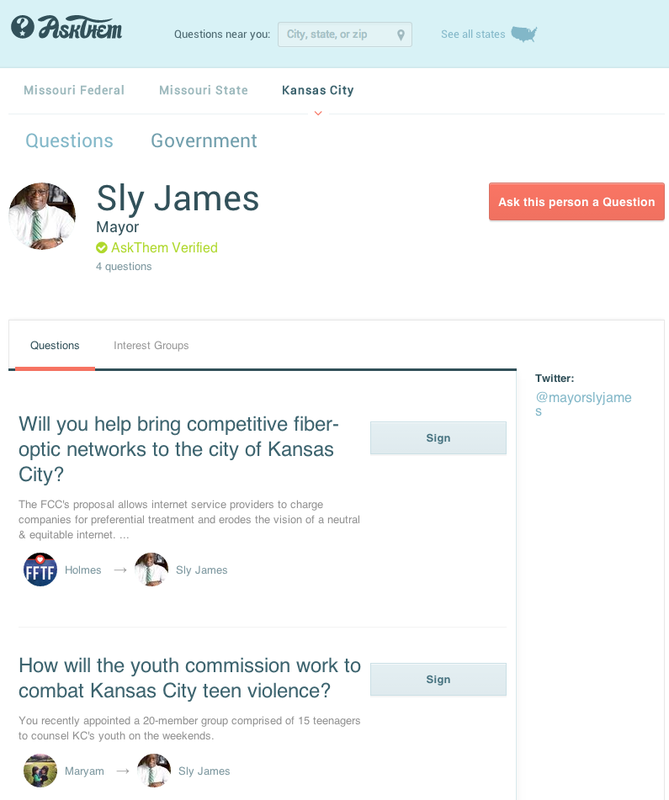 We have over 50 cities with elected official info on AskThem, thanks to Google Civic Innovation & our custom scraped data, which I believe leads the way in a non-profit project! Beyond these basic site features, we launched with additional features to support good questions on national policy issues and community issues near you. A. City council agendas – we wrote unique code to bring in city council agendas for Philadelphia, a Knight Foundation community, and can extend this code to any 80+ cities nationwide that use Legistar. Ask informed questions of your elected officials, before and after city council meetings, with access to agendas & minutes. B. See our national view of which public questions “have answers” and “need answers” (i.e., reached signature threshold and were delivered), as well as most-recent. This view will be interesting, going into the future, for states (e.g. CA) & cities (e.g. L.A.), to see what issues are being raised for a public response. C. It’s not just for elected officials – ask questions to public figures with a verified Twitter account. So not just U.S. politicians – celebrities, federal government agencies, political media analysts, reporters, international pols, city agencies, pro sports franchises. 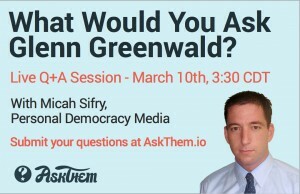 Ask questions and we’ll help you push for a public response from Stephen Colbert, National Security Advisor Susan Rice, the House Republican Caucus, Comcast, one of the greatest living musical artists Kanye West, or New York University. Anyone with a Twitter account (verified or not) can become a verified responder on AskThem – just register a free account and drop us a one-line email to let us know you’re opting-in, and we’ll set you up. Takes just a moment. 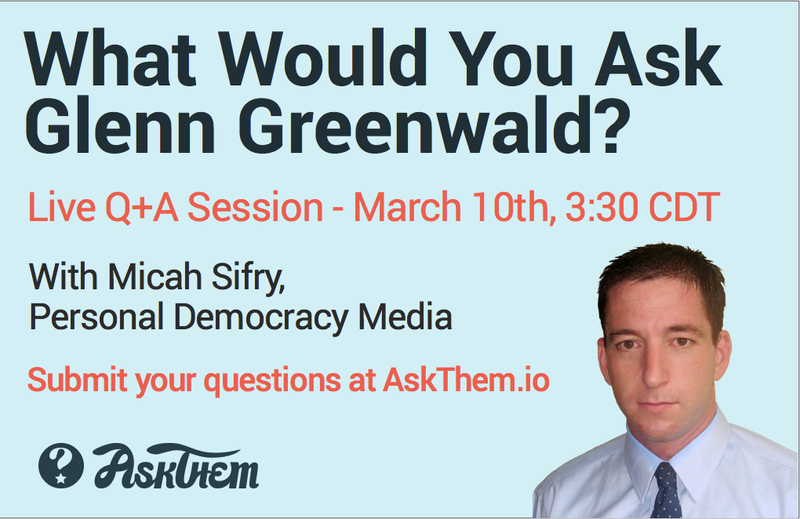 We’re bullish on the model of open online Q&A to surface interesting content, whether it’s on national issues like net neutrality or how states & cities can push forward on municipal broadband and immigration reform. And we’re working to gather charitable funding support to bring the awesome open-source Councilmatic to NYC, as NYCCouncilmatic, as a free informational resource on municipal legislation. 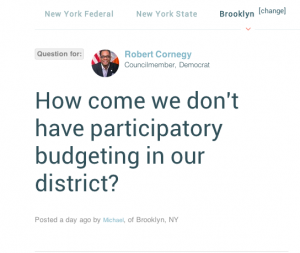 We’ve cultivated great non-profit partnerships with community groups such as Participatory Budgeting in NYC, the Student Net Alliance, OpenSecrets.org, and the Roosevelt Institute to promote their issues and push for a public response. But PPF needs more non-profit funding support to continue operating AskThem through the November 2014 midterm elections. Email me: david at ppolitics.org, for a copy of our non-profit funding prospectus – we have solid ideas for increasing public dialogue over the next four months of political chatter. We’ve been developing open-source tools for civic engagement since 2006, and have not yet secured multi-year core funding support for our work. But our previous flagship, OpenCongress, received over 26 million visits and 69 million pageviews on a skeleton-crew budget, with no keyword ad budget or paid traffic partnerships, and our sibling organizations the Participatory Culture Foundation and Fight For the Future have engaged millions of members in their campaigns. Our team has proven we can activate millions of people to get involved in the political process, many for the first time, and activate their social networks, but we need a bit of basic funding support. We have big ideas for online civic engagement, but haven’t had the capital to act on them in the past several years, as the civic tech field has shifted somewhat away from robust support of open-source platforms. I. Crowdsourced online Q&A in all 435 U.S. Congressional districts between the candidates – as well as major gubernatorial elections in NY & TX, and elsewhere. For this, we could use programming time to make it easy for visitors to find their Congressional districts and vote up the top questions, as well as submit their own. II. Partnerships with regional and national media, to promote popular questions ahead of debates and town hall meetings. For this, we could use funding support to build free & open-source widgets to embed AskThem functionality in other websites (e.g. a local political blog or state-capitol newspaper site). III. City event Q&A forums – ahead of city council meetings and local elections, or simply to promote the two most popular questions every month for a public response. Cities are where we’ve seen the most impact in users submitting questions on AskThem and getting answers – especially here in NYC, where we’re based, and we’d like to continue using our networks in Code For America and others to be able to engage more leaders in responsive city governments. There aren’t a whole lot of other relatively-small 501(c)3 non-profit organizations making free & open-source tools for civic engagement out there. The Public Accountability Initiative focuses on research & corruption, awesomely, and Control Shift Labs focuses on tools for activating membership of non-profits, also awesomely and providing great value. But PPF is a bit different – our tools, since 2006, have been about connecting a wide audience of visitors (many arriving from search) to the official government information they want, and free web tools to convey their ideas and opinions to elected officials in open-data standards. The promise of open-source software has been for easily-remixable, user-friendly grassroots activism tools and effective networked watchdogging, but so far the funding support hasn’t been prioritized for web tools for distributed communities to use in amplifying their feedback. But AskThem is a good start, a national Q&A platform for every U.S. elected official, with hooks as outlined above into the actual legislative process of governments. We’ll continue to build on our experience from creating & running OpenCongress from 2006 – 2013 and more in spreading AskThem to more states & cities, to build a culture of continual & reciprocal communication with elected officials at every level of government, but we need more support to fund our basic site operations and our small team. Please be in touch to help connect us with a philanthropist in your network, and feel free to make a tax-exempt donation to our non-profit work, via our partners Action Network. How will you use AskThem in October, ahead of the November elections? Let us know your feedback and ideas! We’ll work with you to promote your issue, ahead of every Congressional election nationwide. Email us: david at ppolitics.org, maryam at askthem.io, @AskThemPPF on micropublishing, like our AskThem page on social networking service even. Hope you’ll help us spread the word.